See how experts make their Word documents look better and more professional. Formatting Magic with Word is your comprehensive guide to the document formatting options in Microsoft Word. Over two decades of experience writing Word documents, flyers, certificates, signs and more packed into over 240 pages. How to change the default font in Word? It’s a staple of ‘Word Tips’ columns. Sure, we’ll show you how to do that, but we’ll also show how to change other Word defaults like page size, line spacing, paragraph settings and more. Modern Office has many Galleries, lists of pre-set designs and options that are quick and easy to use. Perhaps too quick and too easy because too many documents look the same even when they come from different authors. Formatting Magic with Word looks beyond those Galleries and shows how to change and adapt those designs into unique and different looks. The book goes through all the common options for fonts and paragraphs that you’ll find on the Home tab, but also many other choices that can help you make your documents really stand out and look professional. In other words, in-depth with the Word choices that are hidden behind the simple ribbon choices. All the options to make lists that suit you, your boss or teacher. Also list features and tricks that might surprise you. SmartArt is a graphic way to display lists that’s worth considering. So many possibilities to make your documents look great. Mirror, Reverse and Flipping text. 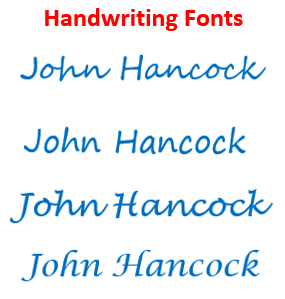 Handwriting fonts.Drop Caps with many choices including fancy lettering, colors and even pictures. Some ‘copycat’ looks from Star Wars or Thunderbirds. Highlighting isn’t just for marking up a document. Word Tables are intended to present grids of information, but they have another use in solving difficult formatting problems. Similarly, Text Boxes are a lot more powerful than the name suggests. The name ‘Text Boxes’ is a lie. They can contain a lot more than just text and don’t have to be boxes! Then we’ll show you an easy way to use those formats. Word has a great way to standardize the look of your documents, but it’s been so clouded in mystery and confusion that even the name scares people away: Styles. Styles can be your friend .. no honestly they can … there’s no need to run screaming at the very mention of styles. Formatting Magic in Word makes it easy. We’ll take you through the basics of styles and why they are good for you. We’ll also tell you about parts of styles that are good for experts but best for us mere mortals to avoid (at least at first). As usual with Office-Watch.com books, we don’t limit ourselves to the narrow topic. There’s useful extra coverage in this book that will help you make better Word documents.